All transactions are safe and secure with a reliable history in online purchasing behind each of our associates. 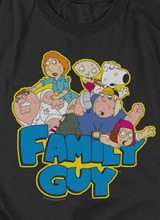 Buy the Family Guy The Griffins t-shirt to own Family Guy clothing and merchandise. In addition to looking for a Stewie Family Guy t-shirt, don't forget about Brian Griffin and the humans in the Griffin family. Wear this design to celebrate the family. Here, the Griffins, including Lois, Peter, Meg, Chris, Brian and Stewie are having a bit of a feud. This bestselling tee will remind everyone that a great deal of fun can be had when spending time with the family. Pair it with All I Know I Learned from Family Guy Stewie t-shirts. In addition to the Family Guy The Griffins tee above, browse the Family Guy Clothing Gallery for more apparel like men's and women's clothes, kids shirts or hoodies.